The new harvest-notification policy, which took effect this weekend, is the first of its kind among states that have legalized marijuana and is intended to ensure legally grown Oregon weed isn’t transported out of state. 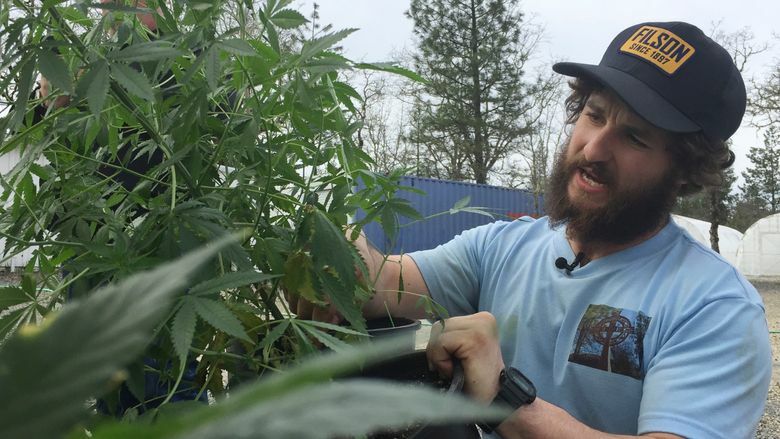 PORTLAND — Before Matthew Miller harvests marijuana this fall from his fields in southern Oregon, he’ll have to notify the state for the first time ever — a process that could bring inspectors to make sure none of his pot is being illegally diverted. The new harvest-notification policy, which took effect Saturday, is the first of its kind among states that have legalized marijuana and is intended to ensure legally grown Oregon weed isn’t transported out of state. Oregon has an excellent pot-growing climate, and its rules allow applicants to have multiple licenses, permit out-of-state investment, and don’t cap grower licenses. The generous policies have resulted in an oversupply of legal weed, with growers desperate to unload crops now worth half of what they were. In this environment, the harvest-notification rule has riled many cannabis cultivators who say it amounts to more bureaucracy in an industry already struggling to stay afloat. Oregon’s adult-use market has struggled for months with too much marijuana. As of June, there were nearly 1 million pounds of “usable flower” in the system, and an additional 350,000 pounds of marijuana extracts, edibles and tinctures. Usable flower refers to the dried marijuana flower — or bud — that is most commonly associated with marijuana consumption. The Oregon Liquor Control Commission regulates the state’s general use marijuana program. It stopped accepting applications for new growing licenses in June so it could process a monthslong backlog. State lawmakers next year will likely consider a cap on the number of permits issued for grows and fund more field inspectors. Amid the glut, U.S. Attorney Billy J. Williams has pressured the state to tighten the rules and crack down on growers who may be diverting supply to the black market. Sheriffs in the southern Oregon counties most affected by outdoor growing sites have been vocal about a lack of resources to sleuth out illegal marijuana farms. State regulators last month targeted one possible problem when they reduced the amount of marijuana flower a medical-marijuana patient can buy per day at a retail store from 24 ounces to 1 ounce for a six-month trial period. The change was prompted when the liquor panel noticed a handful of stores were selling flower in bulk over and over again. Their plants will now be tracked from seed to sale just like nonmedical cultivators’ are. Sixteen inspectors are tasked with visiting these larger medical growers to look for diversion, with more to be hired, said Mark Pettinger, commission spokesman. For the nonmedical growers, the harvest rule will require them to notify the state by 9 a.m. on a day they plan to harvest by entering their plans into a cannabis tracking system. State regulators originally wanted 72 hours’ notice, but cultivators pushed back. The state general use program has 23 inspectors — not enough to show up at each harvest site — but the possibility that an inspector could come knocking should provide an incentive to follow the rules, he said. The agency will also reconcile the anticipated harvest entered into the system with what actually comes in, he said. Sixty-five percent of Oregon’s outdoor growing sites for recreational-use marijuana — 258 farms — are concentrated in two rural counties, making it easier to place resources before harvest time in late September or early October, Pettinger said. “Which target are you going to go after if you’re shooting? You’re going to go after your easy target,” said Pete Gendron, president of the Oregon SunGrowers Guild, which advocates for outdoor pot farms. Others say state-licensed growers would be the last to divert marijuana to the black market pot they’d be risking tens of thousands of dollars spent to sell pot legally.